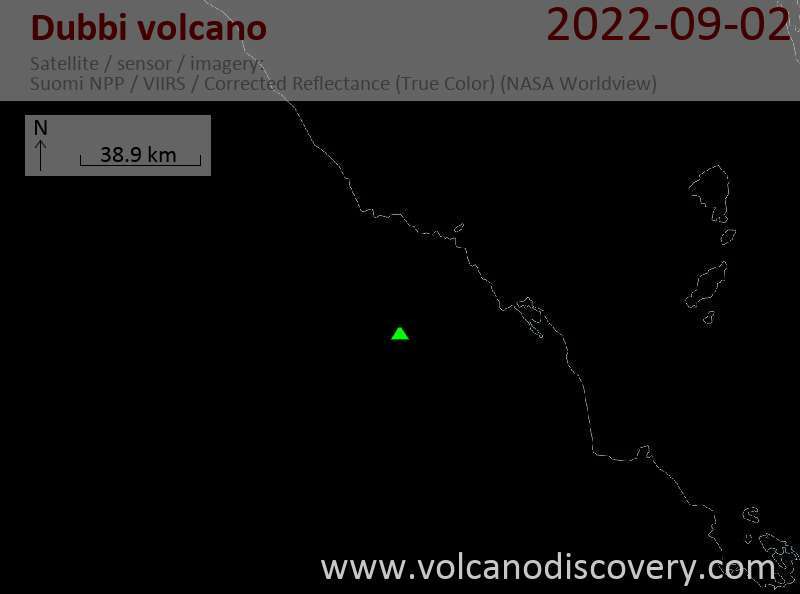 Dubbi volcano in Eritrea is a large volcanic massif rising 1625 m above the the western shore of the Red Sea. It is located in the Afar triangle south of the crystalline basement rocks in the Danakil Alps east of the Danakil depression and east of the Erta Ale range. The two most-recent eruptive centers are fissure systems that extend NW-SE and NNE-SSW. The former produced lava flows that reached the Red Sea in 1400 AD. The second created 19 small craters at the summit in 1861. Ash fell more than 300 km from the volcano. Two villages were destroyed and more than 100 persons were killed during Africa's largest eruption in historical time. Lava flows from the 1861 eruption traveled as far as 22 km and reached the coast. An eruption on 12 June 2011 from neighboring Nabro was originally believed to be from Dubbi. There are about 20 cinder cones at the summit and large basalt lava flows to the north and NE of the volcano, forming the Edd lav a field, which covers 2700 sq km and stretches to the coast of the Red Sea. Dubbi volcano is part of a volcanic alignment that extends SW from the Red Sea spreading axis to the southern tip of the Tat Ali axial volcanic range. The 1861 eruption from Dubbi volcano took place from a new fissure system NNE-SSW and produced 19 craters at the summit. The eruption was partly explosive, unusual for the Afar region, and produced a large ash column and caused ash fall more than 300 km from the volcano. 2 villages were destroyed and more than 100 persons were killed during what is probably Africa's largest eruption in historical time. Lava flows from the 1861 eruption flowed as far as 22 km and reached the coast. "On the night of the 7th or the morning of the 8th of May, the people of Edd were awakened by the shock of an earthquake followed by others which continued with little intermission for about an hour. At sunrise, a quantity of fine white dust fell over the village. . . . About noon, the character of this dust . . .resembled red earth. Shortly afterwards, it increased to such an extent that the air was perfectly darkened and we had to light lamps in our houses. It was darker than the darkest night, and the whole place was covered with dust, nearly knee-deep. At night [on May 9], we saw fire and dense smoke issuing from a mountain called Djebel Dubbeh." In 1400 AD, an eruption produced lava flows that reached the Red Sea. The vents of the eruption were along a NW-SE fissure system still visible in the terrain.